The best price is for Novastar C1 + N9. They are sold as a set, not separately. 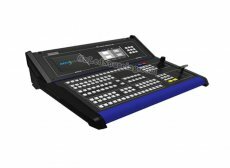 The C1 is a hardware console of NovaStar specifically designed for LED display video wall products with high-end video processing effects and mainly used for live stage control. The C1 is designed with 2 LCD screens. One is used to monitor input sources. The other, together with buttons on the panel, is used to configure the layer size, layer position, input source, output resolution, layer border, and input cropping. The C1 is also designed with a joystick and T-Bar. The joystick is used to precisely adjust the layer size and position. The T-Bar supports 1024 levels of layer transparency adjustment, finely controlling the transition effects of presets. Thanks to the cool LED buttons, highly sensitive joystick and T-Bar, plus the 2 LCD screens, the C1 is extremely easy to operate, making live stage control most convenient.  Support two LCD screens, one for monitoring, and the other touchscreen for operating. During operating, users can view on one of the LCD screens the input source status, preview status and status of output on the LED display, so that the overall situation is under control.  Supports control of up to 16 terminal devices.  Supports control of NovaStar video splicing processors.  Supports screen mosaic, easy mosaic, output image quality adjustment, BKG settings, EDID settings, test patterns, and switching from normal display to blackout with one button press.  Supports up to 16 presets.  Supports preset copying, use of preset templates, preset customizing, saving of custom presets, preset data cleanup, lockup of the preset area on the C1 operation panel.  Supports up to 8 ×layers, 1 ×OSD, 1 ×BKG, and 1 ×LOGO.  Supports configurations of shape layers and layer mask.  Supports layer adding with one button press, layer cleanup with one button press, and moving a layer to the front or back with one button press.  Supports layer editing, layer image quality adjustment, layer border settings, and layer freezing.  Supports settings of the layer size and position through the joystick and buttons.  Supports input source cropping.  Supports 13 layer transition effects and settings of transition duration.  Supports adjustment of the joystick’s sensitivity.  Supports manual adjustment of the fade transition effect of layers by using the TBar.  Supports remote or live control of terminal video processors through RJ45.